I will always remember Vernon Humpage’s shoe shop, fabulous expensive shoes in a ‘posh’ shop next to the Winter Gardens entrance on St Johns Square.. little did I know as a young woman the treasure that was beneath the false wall coverings. When the refurbishment of the vaulted entrance to the Empress ballroom was completed in early March and The Theatre Bar opened I was excited to see the Neatby tiled panels but was unprepared for the beauty of what I found, nine ornate panels which date back to just before the turn of twentieth century . 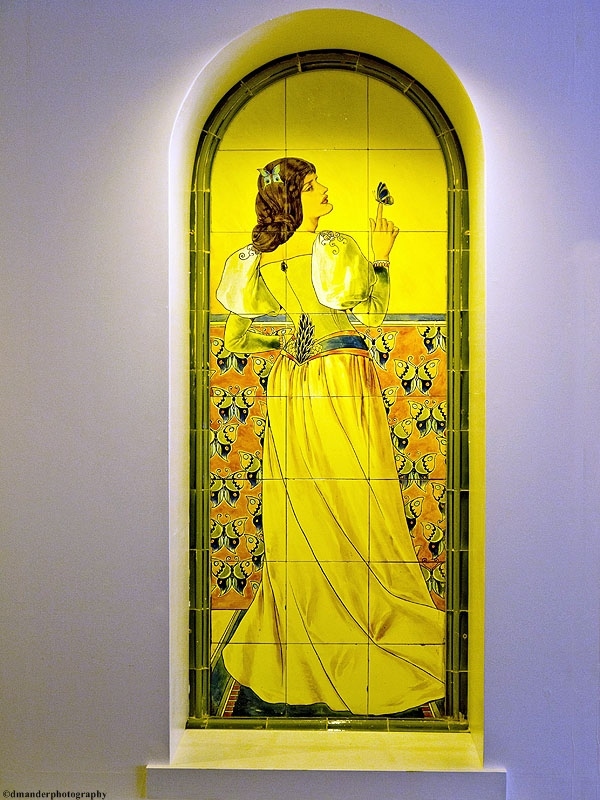 The stunning art nouveau panels feature a range of ladies in exotic costumes set in groups of two on either side of the dining area. The 15 known names of the panels –originally a set of 28 – are those of semi-precious stones,birds or butterflies and were created on commission by Doulton, now Royal Doulton, and designed by their leading artist William James Neatby. The arts and crafts ceramic sculptor and artist W. J. Neatby, native of the town of Barnsley, is best known for his designs of the tiles in Harrods food hall though his work is fairly widespread, as decorative tilework and architectural sculpture in terracotta for Doultons, with whom he had a long association as well as designs in metalwork, enamelling, painted murals stained glass and furniture. In London, apart from his work for Harrods there is also Orchard House on Great Smith Street/Abbey Orchard Street, with a terracotta frieze of peacocks and apple trees by Neatby. 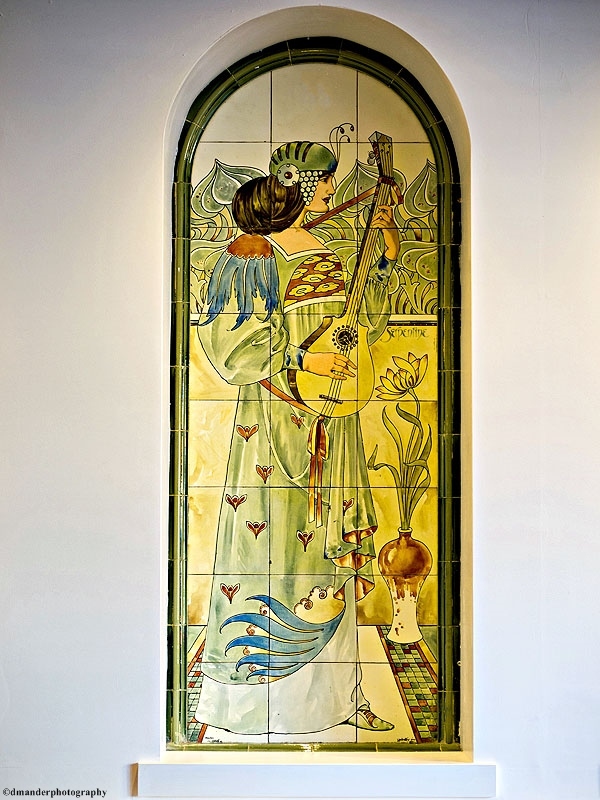 The beautiful panels in The Theatre Bar were originally surrounded by multi-coloured tiles and the vaulted ceiling was said to have featured varied designs in rich and harmonious colours, featuring mermaids, seaweed and fishes. However the increased footfall of the present Opera House, built in 1938-39, necessitated the removal of panels at the rear of the hall and then the vaulted ceiling was removed to create offices on the first floor. Now only 12 of the original 28 panels survive. For many years, 11 of the panels could be seen in Brown & Mallalieu’s car showroom, but thankfully they were carefully covered over in 1972 when the premises became the shoe shop though now only 9 are on view. I did ask the staff if I could go in to the kitchen to search for the missing 2 but alas they politey refused. So, if you are out and about in Blackpool town centre or at the Winter Gardens for a show this summer, drop in to the Theatre Bar and see these beautiful panels, another gem in the crown of a fabulous building.